Padraig Harrington is an Irish professional golfer who plays on the European Tour and the PGA Tour. He has won three major championships: The Open Championship in 2007 and 2008 and the PGA Championship, also in 2008. 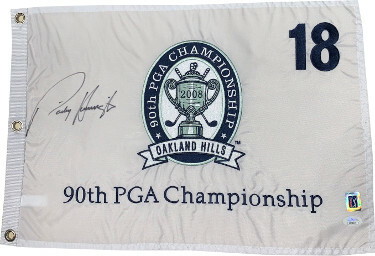 Padraig Harrington has hand signed this 2008 PGA Championship Pin Flag at Oakland Hills . (approx size 20x14) JSA Hologram #DD39083 and Certificate of Authenticity.